Argentina has a long and somewhat complicated history with feminism. Despite a history of powerful women who have made national advancements in women’s equality—names you might recognize like Eva “Evita” Peron, Marquita Sanchez and Cristina Fernandez de Kirchner—abortion remains illegal, and the rates of domestic violence and femicide are high. A 2016 study estimates that one woman is murdered in Argentina by her male partner every 30 hours. Because of this, new waves of feminists have organized grassroots campaigns and protests like “Ni Una Menos” (Not One [Woman] Less) to push the government to better protect women. 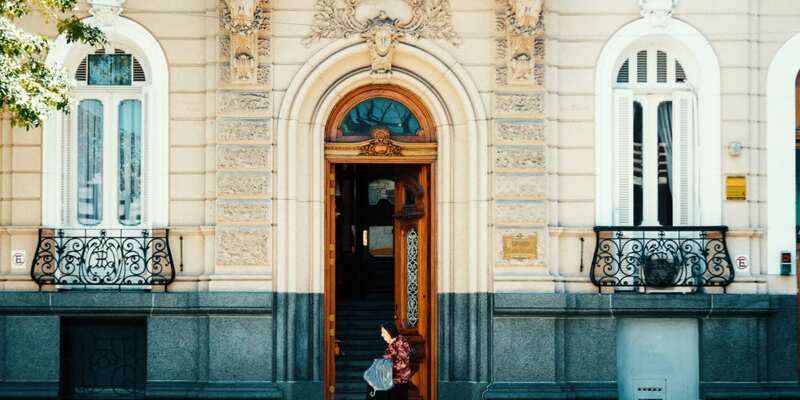 If you’re traveling to Buenos Aires for the first time, you’ll likely not notice any of this, but you can help support women in Argentina by visiting these women-led stores, hotels, and co-ops. 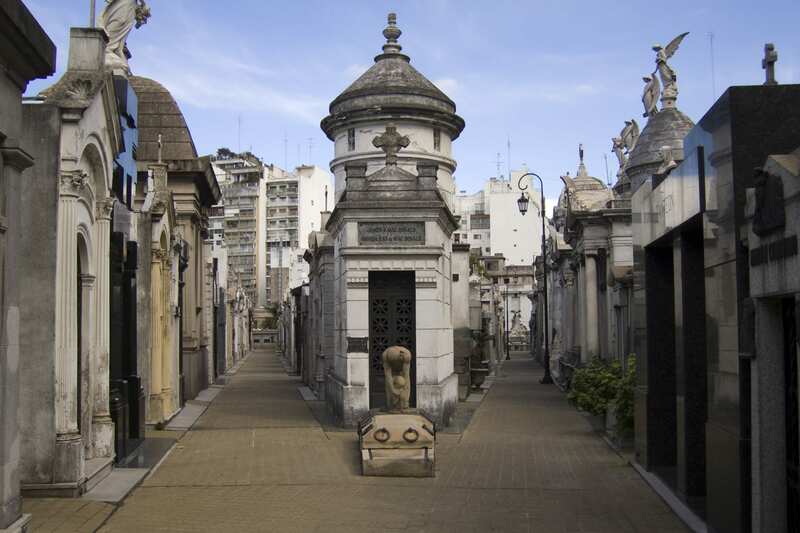 Recoleta’s most popular attraction is a 14-acre cemetery filled to the brim with vaults (4,691 to be exact). Among them is the famous tomb of one of Argentina’s most notable figures, Eva Peron. Evita founded the Female Peronist Party in the late 1940s, which pushed for the rights of women to vote and run for office. The party also set up the country’s first wave of female clinics, which were established in poor neighborhoods to provide women access to medical, legal, and social care. Commemorating the May revolution that began Argentina’s fight for independence from Spain, this famous plaza is often referred to as the political center of Buenos Aires. Plaza de Maya boasts a history rich with protests and has been a stage for those voicing their grievances and sparking a revolution, among them the advancement and protection of women in the country. On one side of the plaza sits La Casa Rosada (the Presidential Palace), and on the other side is the Metropolitan Cathedral. Buenos Aires is home to the only feminist bookstore in Argentina, Liberia de Mujeres, and it’s worth a visit. Their documentation center has over 8,000 works pertaining to the advancement of women. Founded in 1995 by Piera Oria and Carola Caride, the store features books, journals, and publications focused on the idea of gender. Considered one of the most important bookstores in Latin America, the Liberia de Mujeres celebrates the work of women. Graffiti Mundo is a 100 percent women-owned and operated non-profit tour company that helps you discover some of the city’s best street art, which has often helped shape politics in the country. 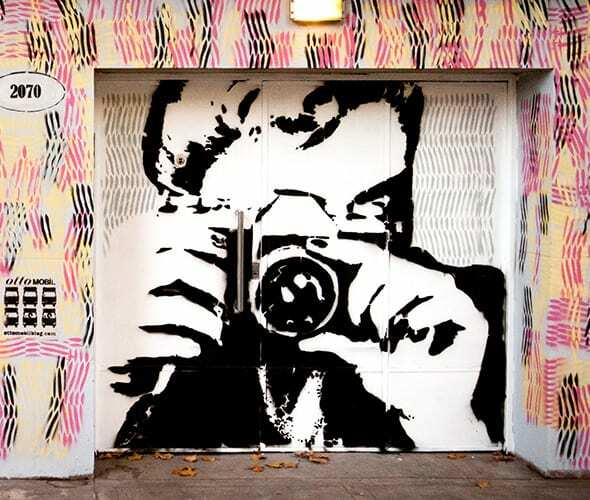 Their local tours explore the city’s vibrant urban culture and the street art that captures the creative nature and political leanings of the Argentine people. Graffiti Mundo’s tours are created in collaboration with local artists, allowing for the personal stories of the artists to be woven into the tour. 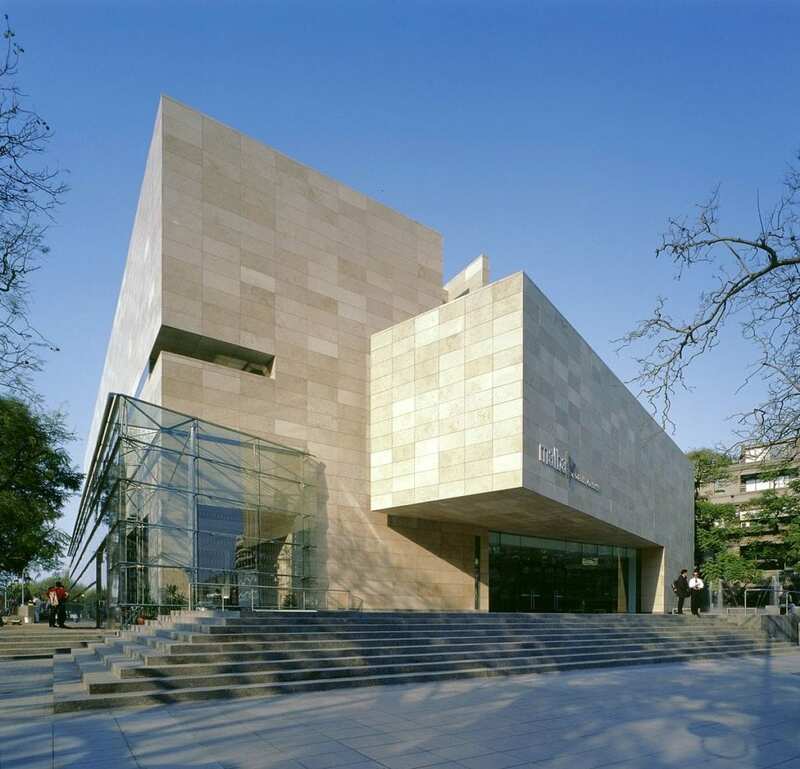 This beautiful and modern museum opened in 2001 and has the Costantini Collection on permanent display. It also prides itself in being a dynamic cultural center with constantly evolving and changing art, film and cultural exhibitions, many created by women. 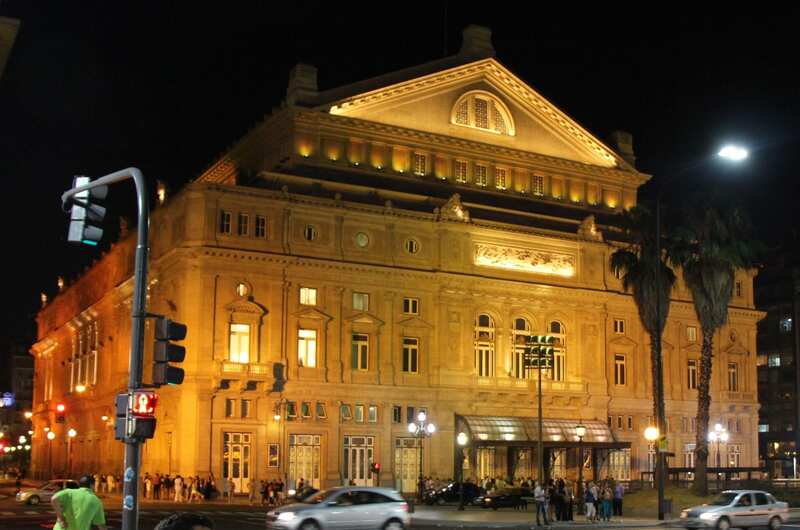 Known worldwide for its exceptional acoustics and the artistic value of its construction, Teatro Colón turned 100 years old in 2008. Recently renovated and in pristine condition, tours of the theater are worth the nearly 60 pesos it costs. That being said, sometimes you can find tickets for shows at around 90 pesos, and it’s worth the difference. Make a night of it and experience this incredible space through the performances it hosts. 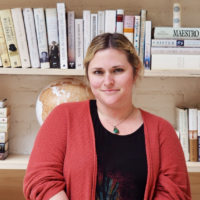 Falena is a charming woman-owned bookstore that doubles as a wine spot. From the outside, the brick facade and isolated street of Falena gives the sense that the store is closed, but step inside and you’ll enter a sun-draped sanctuary that pairs hand-picked books by local writers with Argentinean wine. Narda Comedor is a plant-based restaurant opened by the famous Argentine chef, Narda Lepes who is championing vegetarian eating in a country with the world’s second highest beef consumption. In 2017, Narda Comedor opened to rave reviews features creative recipes inspired by Narda’s travels. Chila is an upscale restaurant created and led by the award-winning female chef, Soledad Nardelli, who is the first woman to be named “Chef of the Future.” Chila is also the only restaurant on the Latin America’s Best Restaurant List, where a woman is an executive chef. Chila offers one tasting menu and one vegetarian menu, but you’re guaranteed to be delighted at the inventive dishes that come your way. For a more upscale option, stay at the Recoleta Grand, which is just a short walk away from the Recoleta Cemetery. This comfortable property is a wonderful place from which to explore this quiet, romantic, and historic neighborhood. Touted as the first eco-friendly property in Argentina, Eco Pampa Hostel works with the environment to optimize the use of natural resources. 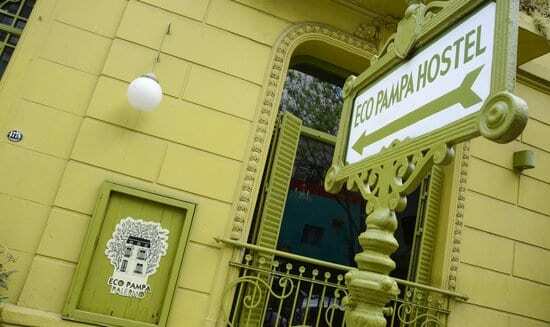 The lime-green facade of the hostel is hard to miss as it sits in the heart of Buenos Aires' Palermo neighborhood. Located on a quiet street, within walking distance from stellar cafés and bookshops, the hostel provides a safe and welcoming environment for solo travelers and backpackers. Female travelers can opt to book a single, double-bed room with a private bathroom. * A longer version of this feminist city guide appears in the Fall 2018 ‘Resilience’ Issue of Unearth Women, on sale now. « Is it Safe to Travel in Honduras as a Woman? Useful information to have. This city is definitely on my list! Love this, but your peso conversion rate is a bit off…I live in Buenos Aires, and a tour to the Teatro Colon currently costs about 600 pesos, not 60 (about $20 vs about $2). Still a must-do, though!